The start of fall marks a new season of exciting events, school tours, Art School classes and exhibitions. One upcoming show is close to my heart and particularly worth highlighting—Abstract Expressionism: Looking East from the Far West. Before I returned to Honolulu in January, I had worked with the Royal Academy of Arts in London to help install their great Abstract Expressionist survey exhibition last summer. Two things occurred to me when working on this project in the UK: First, that Anna Rice Cooke undoubtedly had that august institution in mind when she established the Honolulu Academy of Arts (HoMA’s predecessor); and second, that the Honolulu show will be far more interesting! 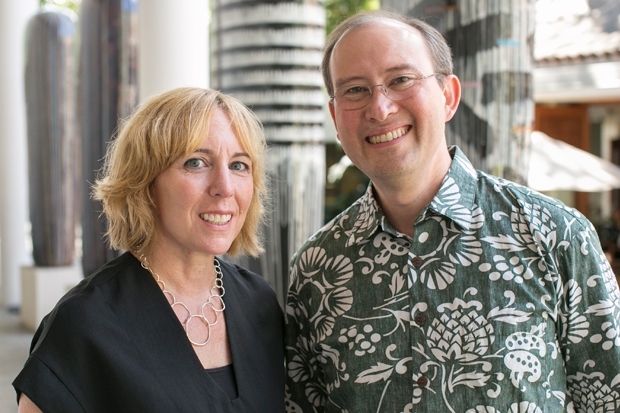 According to Dr. Theresa Papanikolas (pictured with me above), who curated Abstract Expressionism: Looking East from the Far West, this milestone show is the first exhibition to take a perspective on mid-century abstract art by addressing work of Japanese and Asian-American masters, including artists from Hawai‘i. We will see the work of New York School artists, such as Mark Rothko and Jackson Pollock, presented with Japanese artists, such as Morita Shiryu and Ansei Uchima, and with Asian American artists who studied and worked in New York just after World War II, such as Satoru Abe and Harry Tsuchidana, thereby looking at Asian influences on the most significant American art movement of the 20th century. This will be Dr. Papanikolas’s final exhibition as Curator of American and European Art. After a five-month trial run, she now assumes the title of Deputy Director of Art & Programs, a new position for HoMA, but one that exists in other mainland institutions. The role is part of a restructuring that allows for the various parts of the museum to work together instead of working in silos. She now oversees the museum’s education-related departments—the Art School, Learning & Engagement, and Outreach, as well as Visitor Services, Collections Management, and the Robert Allerton Art Library. In addition, Aaron Padilla, who was director of Spalding House and interim curator of education, is now the director of Learning & Engagement, our restructured and renamed Education Department. The idea is that all these departments will now cooperate on programming and coordinate schedules so that we can more effectively serve our public. Without doubt, HoMA presents fabulous exhibitions, such as Abstract Expressionism, and offers stimulating activities, such as popular painting classes. Now we bring these elements together, by having a painting class while simultaneously presenting a show in which the students can see first-hand how Tadashi Sato and Jackson Pollock viewed composition. With this increasing program alignment we are doing the work this institution was meant to do. Only our people can make this happen, and the new organizational structure is helping us achieve our mission. Watch this space! Will this art come just from the museum’s collection? Sounds interesting, I like how in recent years there have been lots of modern things in the shows.